Click here for the best "In Show" 2012 winners list! Attention All Artists and Art Buyers! 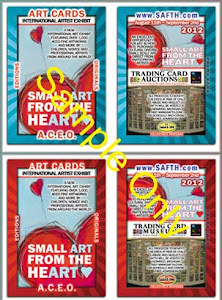 Small Art From The Heart (SAFTH) is an international art Exhibit featuring ACEO fine art trading cards and more by children, novice and professional artists from around the world. 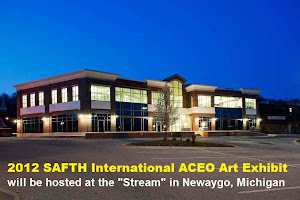 SAFTH will be hosted in at the Stream building, 1 State Rd., Newaygo, Michigan, 49337. Exhibit Dates: August 11th through September 2nd, 2012. SAFTH will be a great opportunity for artists of all levels to showcase and advertise their talents, gain exposure to art and a charitable cause. All art displayed is direct from the artists and cannot be found in stores! Many of the participating artists have never created ACEO art before and have donated their time and art exclusively for this charity exhibit - over 2,000 pieces of art that you may never see again! This exhibit will also be an excellent opportunity for art buyers to purchase cultural diverse small scale art donated directly from participating artists specifically for this exhibit for a fraction of the cost of larger scale art. Contact Information on each artist will be available during the show for all art buyers wishing to seek larger scale art direct from each artist at a later date. 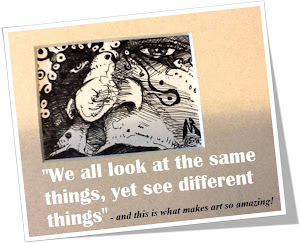 Special groups and organizations, public schools, children (ages 5 and up), novice and professional artists, around the globe, are encouraged to participate in the Small Art From The Heart Exhibition by creating and entering their ACEO art cards in the show. Contact our exhibit coordinator, Sherri Russell at sherriannrussell@gmail.com and pledge to participate! Artists from 35+ countries & 28+ states have pledged to participate from countries and states such as: Nigeria, Mongolia, Ethiopia, France, Poland, Ukraine, Turkey, Italy, Peru, Delaware, Czech Repuplic, Romania, Portugal, China, Georgia, Brazil, Malta, Syria, Russia, Peru, Iceland, Argentina, Thailand, Colorado, Florida, England, California, South Africa, Spain, British Columbia, Texas, Washington, New Jersey, Missouri, Indiana, Minnesota, Quebec, Arizona, Massachusetts, Mississippi, Utah, Montana, Michigan, New York, South Carolina, North Carolina, Nebraska, Ontario...and more are pledging every day! Be sure to visit our "Participating Artists" page to see a complete list of artists and locations. ACEO Art cards are an inexpensive way to purchase desired work from a specific artist at a fraction of the cost of a larger piece. New artists can create cards for the entire world to see their work can open doors of excitement and opportunity. Being discovered can be as simple as learning to make your own Art Cards. Technology and ACEO’s have met at a happy point ushering in an ever-changing art world. 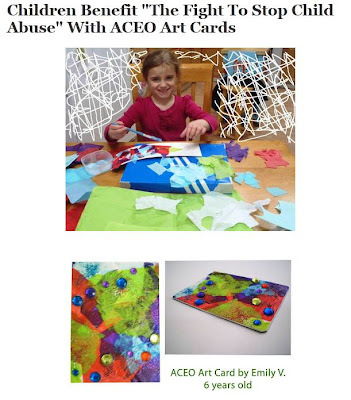 Be sure to visit our ACEO Card Rules page to learn more about art cards. A "Large Scale" Exhibit Of Small Scale Art Attracts Diverse Talent From Around The World! A new “large scale” international ACEO art exhibition, will be hosted in Newaygo, Michigan. Exhibition dates are August 11th through September 2nd, 2012. The “Small Art From The Heart Exhibition” (SAFTH) will be a great opportunity for emerging and professional artists to market and promote their art in a professional and inexpensive manner through the form of small scale art to benefit the cause to end child abuse and neglect. The exhibition's theme will be a celebration of "diversity" - acceptance and respect for all types of art from around the world. There is no submission fee or jury selection requirements for artists to participate. ACEO art cards by children as well as novice and professional artists from all over the world will be on display indoors at the Stream in Newaygo, Michigan, just 30 minutes northeast of Grand Rapids and will attract attendees from a multi-county area. What are ACEO cards? 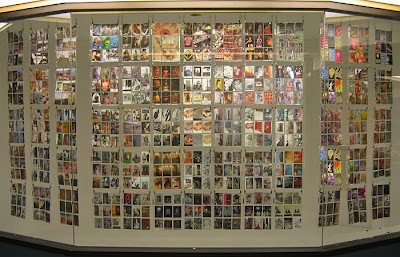 ACEO stands for "Art Cards, Editions, and Originals". 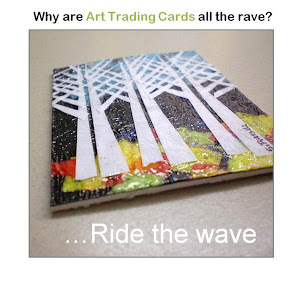 They are also known as ATCs, or "Artist Trading Cards". They can be original artwork, numbered edition prints and photographs. ACEO cards are a fun way to collect art from artists all over the world at a fraction of the cost for larger pieces. Each card is 2 1/2" x 3 1/2" (64x89mm), the size of a baseball card, which makes it easy to collect in display cases or store in albums. Art cards can be on any weight of paper, thin card board or matte, texture, color or subject matter. The expo is announcing a call to all children (5 and up), novice and professional artists "from anywhere in the world" to create and enter ACEO art cards (2 1/2" x 3 1/2" or 64mm x 89mm in size) in the form of; paintings, photographs, prints of original art and mixed media artworks. All art will be juried and 1st place prizes will be awarded to young artists in school grades K-2, 3-5, 6-8 and 9-12. 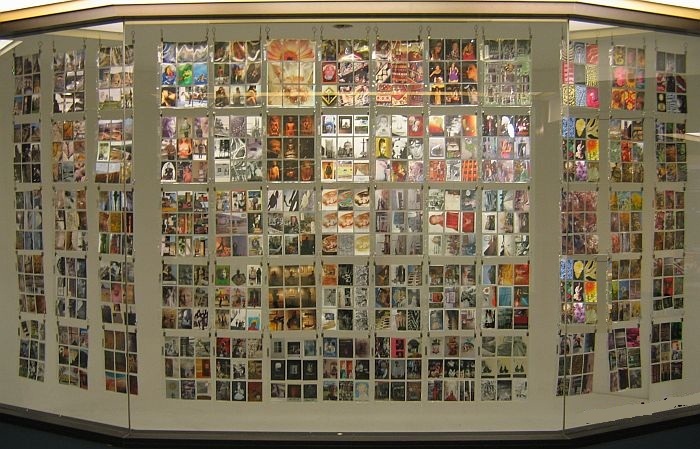 The expo’s goal is to display 1,000 ACEO art cards. The expo is also announcing a call to all art students, novice and professional artists restricted to "the state of Michigan" to create and enter 10 x 10 (or smaller) artworks. Visit River Valley - A Celebration Of Small Artworks for more information. Please keep in mind that thousands of visitors will view this exhibition, including many school children. While the exhibit will strive to exhibit all entries, works that are overly sexually explicit may not be put on display. All small artworks and ACEO art card submissions must be received by July 1st, 2012. If you have any questions or desire more information on ACEO art card rules or submission, please contact Sherri Russell by email at sherriannrussell@gmail.com, or Dawn Campbell at (231) 652-1454. Attention collectors: SAFTH now has Promo Cards - Get them while they last! P1, P2 Limited Edition Promo Cards Sell for $1 each + S&H - Proceeds will help fund printed materials needed for the show! What are A.C.E.O. Art Cards? Newaygo County is in the heart of West Michigan and is home to 234 lakes, 356 miles of rivers and streams and over 100,000 acres of national forest. Once known for its historic logging towns it is also home to the Gerber Baby Food Company now known as Nestle Nutrition. The county is rich in natural resources such as the Muskegon River, Manistee National Forest and the North Country Trail. Outdoor activities are what attract people to the county where you can fish, paddle, hike, bike, hunt and snowshoe - just to name a few. See Michigan.org for more information! All Copyrights belong to Sherri Russell, SAFTH 2012 Expo and SAFTH participating artists. Simple theme. Powered by Blogger.